Fashion is taking a more casual turn on the show, however sharp suits remain a mainstay. “It’s all about polo shirts, short-sleeved button-down shirts, cardigan sweaters, V-neck sweaters, sweater vests, flat-front narrow legged trousers (solids and plaids), loafers and don’t forget your sports coat!” Bryant told AskMen.com. “I love the men’s accessories for this period, and as a costume designer, the accessories tell so much about each of these characters on the show. To name a few accessories, the monogrammed belt buckles, belts, cuff links, collar bars, tie tacks, tie bars, stingy brimmed fedoras, Tyrolean hats, trilbys and walking hats (think Rex Harrison),” she said. Banana Republic has an encore of the “Mad Men” collection that debuted last fall that is inspired by country club scenes of the 1960s, including polo shirts, argyle vests and navy blue blazers. 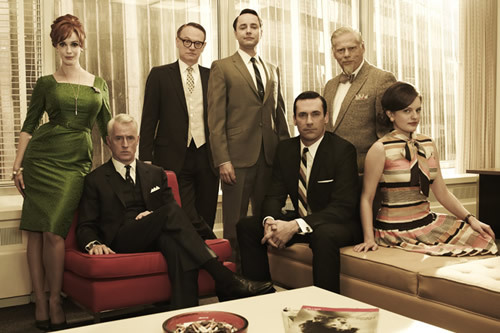 Another “Mad Men” collection is due soon.